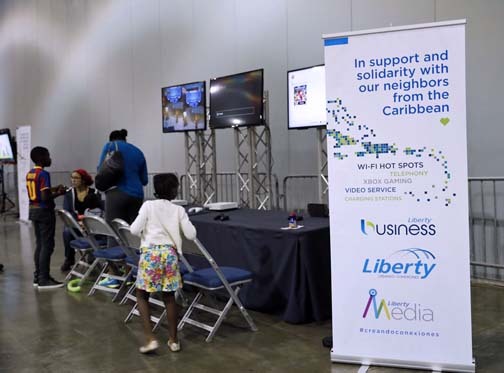 Liberty Puerto Rico and its business division, Liberty Business, installed a special telecommunications infrastructure free of charge at the Puerto Rico Convention Center to receive thousands of travelers from neighboring Caribbean islands struck by Hurricane Irma. This special infrastructure includes a WiFi hotspot with capacity for 2,000 to 3,000 users, a station with 24 phones for local and international calls, two entertainment areas with television, a gaming area for children with three Xbox consoles and television sets and several industrial power strips so the refugees can charge their phones and electronic devices. “We have set up the Convention Center’s Hall C with the services we know that the refugees will need the most, such as WiFi, telephony connections and video service so they can communicate, connect and entertain themselves,” said Antonio Llona, vice president of Liberty Business. The Convention Center will serve as a transition center where the refugees will rest while they are relocated to a hotel, a home or the airport. Hey Buddy!, I found this information for you: "Liberty PR installs telecom services for Irma evacuees". Here is the website link: https://newsismybusiness.com/installs-services-evacuees/. Thank you.